My Blog: Can a Hospital qualify as a Staycation?!! Can a Hospital qualify as a Staycation?!! Staycation: the newest term in counteracting the economic situation in our country. For the past few weeks, many issues with having Octogenarian parents have been coming to surface and having a staycation in the hospital for one of them happened. I'm sure, that with the money spent on this lovely staycation, my parents could have reconnected with family in both Sicily and Naples!! 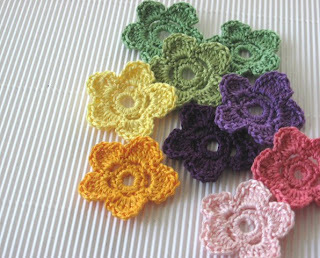 I kid now because everything is ok and the problem was only minor; however, during that time sitting in the hospital room with my dad, I did LOTS of meditation and crocheting! 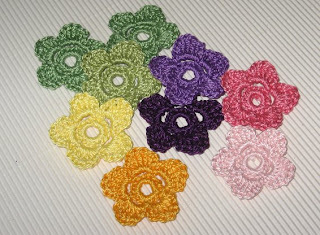 Below are some flowers that I worked on while sitting with my mom. I just loved the color yarn I was working with and kept crocheting, not knowing where I'm going with them or what I will eventually use them for. Actually, that's all my mom would ask me! 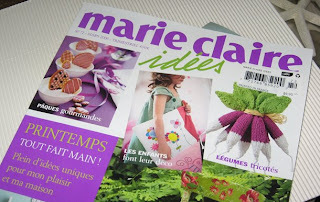 I got the bug of crocheting all these wonderful flowers from this issue of Marie Claire Idees. I can only find these past issues at selected book stores, so to me they are like GOLD! I just love reading them and it's funny how my 3 years of high school French can pay off!! During the past warming streak we've had, I've actually sat on my deck with a cup of tea and pretended that I'm sitting out in the French country side listening to the birds. Here's a photo, below, from the magazine. 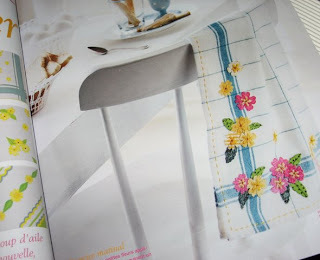 Just a lovely little hand towel with these terrific, repurposed material posies. Just adorable. My pal, Rachel of Thinkoutsidethebox, also did the same thing with a few of her items. Click on the link I set up to check out her flickr account and also those lovely colors from Creative Breathing. Just love them both!! Oh Nancy..I just ADORE you..and your imagination is so sweet and child-like. A quality I think more of us should possess later in our lives. For me..I never dream of being somewhere else but I do often find myself pretending that I am single with no kids! AHH..now that's the life! Thanks so very much for the link and the shout out...you are such a good friend..and I am loving your flowers and their story makes them even more special!